Two teenagers were arrested in connection with the alleged attacks last week on Romanians in Belfast, Northern Ireland, police said. The teenagers, aged 15 and 16, were arrested on charges of provocative conduct. The 15-year-old also faces charges of intimidation, police said. 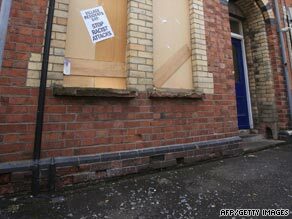 They were scheduled to appear before Belfast Magistrates’ Court on Monday, authorities said Saturday. The arrests follow last week’s attacks on more than 100 Romanians living in south Belfast, in which windows were smashed at their homes. The families — which included more than 40 children and a five-day-old baby — took shelter in a church after the attacks Tuesday night. Belfast officials then moved the families to the campus of Queen’s University while their situation was resolved, according to the Romanian Embassy in London. The Romanian ambassador met last week with Northern Ireland First Minister Peter Robinson, Deputy First Minister Martin McGuinness, and Belfast Lord Mayor Naomi Long. The government officials expressed “deep regrets” over the attacks and promised to try to solve the problem, the embassy said in a statement. Most of the Romanians told the ambassador they would like to return home, the embassy said. The families are Roma, a group of people marked by poverty who live mainly in southern and eastern Europe. They went to Ireland for work, with most of them employed in short-term contracts doing low-paid jobs like washing cars and selling newspapers, according to Vincent Parker, a Sinn Fein party member who visited the families after the attacks.